Duing my trip to Kenya in 2008 I visited the Maasai Market in Nairobi. You can buy all kinds of products from the Maasai tribe here: drums, wooden craft work, jewelry, clothes, and more. At the first sight the main thing that attracts the eyes, are the plentiful bright colors. Many Maasai here like to wear red in particular. Why do these claiming to be suppliers give phone numbers that are off? 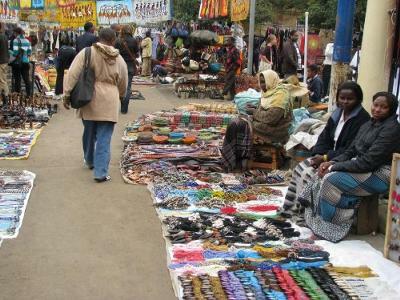 "Maasai" market can be a great place to buy IF you know what you are doing! Its so sad that the vendor's have to deal with the broker's and pay off tour guides to keep them supplied with clients. People will go to maasai market even with out a guide! Go alone (without a guide) and be friendly. To the lady who spent over 300 on about six items..so sorry, that was way, way too much. As a rule start a little high in a bid then only settle for what you are comfortable with. Look the vendor in the eye, compliment his/ her wares and don't let guilt guide you. And remember : "50 shillings won't make you poorer or the vendor richer -so add 50/." Usually hotels DO give discounts to customers, but the prices are higher. The very best deals are at places like Amani a juu, Brackenhust gift shop and the 'Zebra Dukas" across from Sarit. Happy shopping, go with a friend! Hello, I was just reading through these comments and wondering others' thoughts on how I did, price-wise. I wish I had read this before going to the market--I ended up using one of the "brokers" who seemed very friendly with the individual artists (saying he "worked" for the market); we actually had a great time, and I paid less than half of what he asked for. Still, after reading this, I worry that perhaps he ripped off the sellers and me--? Thoughts? I got the following for ksh 26,500 (about $308 USD): a large and medium canvas painting, two wooden bowls (high quality), two stone bowls (high quality in my opinion), and four purses. It was way more than I planned to spend, but I was happy afterwards. What do you think, those of you are Kenyan or live in Kenya? Interesting to read that hotels offer better prices...elsewhere they would be more. Hi there, I'm coming over in a few weeks and I'd like to buy beads to make jewellry with the maasai family I am staying with. Can anyone let me know where to buy beads and how much ksh per weight / number of small beads!? i work at Maasai Market and we are trying to deal with the issue of brokers coz we understand they are robbing our clients. maasai market is not a bad place.for those people labelling it with outrageous names.ignore the brokers!!! !and check prices in other places too before making a decisions. WE VISITED KENYA RECENTLY AND WE WERE STAYING AT NAIROBI SAFARI CLUB. WE HAD A TOUR GUIDE WHO PROMISED TO TAKE US SHOPPING WHERE WE WOULD GET GOOD DEALS. WE WENT TO MAASAI MARKET LATER THAT DAY. WE WERE VERY HAPPY TO BUY A FEW GIFTS FOR MY FAMILY. I KNEW I HAD THE BEST DEAL. AFTER SHOPPING, I NOTED THE TOUR GUIDE TAKING SOME MONEY FROM THE VENDORS. ON RETURNING TO THE HOTEL I PACKED MY ITEMS AS I WAS TO CHECK OUT IN THE MORNING. AT NIGHT I VISITED THE HOTEL SHOP TO SEE HOW MUCH I HAD SAVED. TO MY SHOCK, EVERYTHING WAS QUARTER THE PRICE AND I WAS ALSO TOLD OF A DISCOUNT FOR HOTEL GUESTS. THE SHOP LADY COMFORTED ME AND TOLD ME THAT MANY HAVE BEEN CHEATED LIKE THIS. I WISH I HAD BOUGHT EVERYTHING AT THE HOTEL SHOP. I HAD HEARD A GREAT DEAL ABOUT MAASAI MARKET FROM VARIOUS TOURISTS. LAST MONTH WE WERE STAYING AT NAIROBI SAFARI CLUB. OUR TOUR GUIDE TOLD US NOT TO BUY ANYTHING FROM THE HOTEL GIFT SHOP. INFACT ONCE WE ENTERED THE GIFT SHOP, WE WERE IMMEDIATELY TOLD THAT THINGS WERE CHEAPER AT THE MAASAI MARKET. I WISH I HAD NEVER TRUSTED THAT TOUR GUIDE. OUR GROUP ENDED UP AT MAASAI MARKET AND LATER CITY MARKET. IN THE EVENING AFTER WE ENDED OUR TRIP, OUT OF CURIOSITY, I VISITED THE HOTEL GIFT SHOP. I BROKE DOWN WITH TEARS IN FROM TO OF EVERYONE. WE HAD BEEN RIPPED OFF AT THE MARKET. IMAGINE WE HAD PAID 20 EUROS FOR A SOAPSTONE ELEPHANT WHILE AT THE HOTEL THE ELEPHANT WAS ONLY 250 SHILLINGS. TO MAKE MATTERS WORSE, I HAD SPENT ALMOST 600 EUROS THAT DAY ON ONLY A FEW ITEMS. I WAS ROBBED OFF AT THE MAASAI MARKET. I WAS ALSO WARNED LATER BY THE GIFT SHOP LADY THAT MANY PEOPLE ARE FOOLED AS I WAS. I WAS LATER TOLD THAT A DISCOUNT OF UPTO 20% WAS AVAILABLE AT THE HOTEL SHOP DESPITE UN BELIEVABLE PRICES THERE. THE VARIETY WAS ALSO BREATH TAKING. I JUST WISH I HAD SPENT MY MONEY AT THE HOTEL SHOP. I HIGHLY RECOMMEND BUYING FROM THE GIFT SHOP AT THIS HOTEL BECAUSE OF THE PRICES. I HAVE COMPARED EVERYWHERE AND THIS IS THE CHEAPEST PLACE. THE INDIAN MANAGER IS VERY SWEET AND VERY HELPFUL. LATER I SPENT 50 EUROS AT THE HOTEL SHOP AND ENDED UP WITH A HUGE DISCOUNT AND FREE GIFTS. I was in Masaai market recently and i had a marvelous time. Though they have a lot to choose from, i appreciate the work of art involved. Very beautiful, am a kenyan and i love my country. I bought a few neckless etc. love them. Good prices too. I visited the Masai Market in August 2011. Immediately I was joined by 3 brokers. These brokers do not let the sellers mention their price of their products. They just collect the items that you like and at the end of the visit discuss on the price of not each item but all items put together. Those who do not bargain atleast 50% are in for a great loss. You need to bargain for atleast 65-75%. Thats when you end up with a reasonable buy. There was a small mask which the broker was trying to sell for KSH 1200/- which later I manager to buy for KSH 230/- directly from the seller as the broker gave up with my bargaining. So you need to understand anything you buy in Kenya, make sure to get a good bargain. My mum and I work at the masai market.It is usually the tourists who like entertaining the brokers. If you enter the masai market and these men start following you simply refuse to buy anything.Firmly tell them you have been to the market and know the price.That way you can reach my mum and I and many other vendors who have no intention whatsoever of stealing anything from you. Better still you can call me and I will be able to assist you to buy everything. MAASAI MARKET A DEN OF THIEVES! I hate to say this, but shopping at the Maasai market is a nightmare given the many thieves in the form of brokers! We went shopping with my three American friends and had a very bad experience. We ended up buying afew items for US$1400 and saw the same somemewhere else at half that!! Remove these broker thieves please!. I have had visitors from America, the UK and Germany coming to visit. Each time i take them to the market, they let me do all the bargaining and it has been a win/win situation for both my guests and the traders. I have also on several occasions been recommended by them and as long as tourists have someone they can trust shopping becomes a smooth sail event.Anyone in need of help can just ask through this site.Enjoy better shopping. Im a young Caucasian british girl who visited the maasai market in Nairobi in August 2010. Luckily for me i had already passed a month in Kenya, so I was aware of the common "tricks" to get tourists to pay up ridiculous amounts of money. The key is to not feel pressured into buying. If you can't bargain down to the price you want to pay, walk away. (Chances are they will magically accept your price as you are leaving). Don't let anyone separate you from whoever your travelling with, and don't let anyone pull you away to their stall. tell them you are looking round at your own pace. Simply, look at what you want to look at, have a maximum price you want to pay, talk only with the owners at the stall, and if you can't bargain down to it, thank them and walk away. If they follow you, politely ask them to leave you alone. If you do this, The Masai market can be a wonderful, cultural experience that doesn't break the bank! I attended the Maasai Market on Saturday 21 may 2011 in the City Centre and after the Taxi was directed to park in an isolated spot by the broker. The broker then took me and my taxi driver into the market and proceeded to spin a story that they are a community and everything I intended to buy will be bundeled together and at the end he will negotiate a discounted price which will be cheaper than individual prices. After selecting about 20 item we proceede back to the car in its isolated place and after listing an initial price of 110,000 Kenyan shillings (about USD 1,375) I stated I did not wwant anything as it was way too expensive, After much bargaining I was surrounded by about 10 Kenyan men and fearing for my safety ended up paying 12,000 Kenyan shillings ($140) for 9 items , 2 maasai blankets , 2 scarfs and 5 bracelets and a limestone box in the shape of Africa. At the airport I saw that I paid almost double if I had bought it at the airport. Rather get a local that the hotel can supply before entering the market, These unscrupulous brokers rip you off and are determental for the seller where if you paid the seller you would buy much more!!. I have seen 'horror' stories on this site, that detail what happens when visitors/tourists go to unsupervised markets. One of the markets where you are ASSURED their will be no harrasement is the Maasai Market at Galleria Mall. Its a new market, less than three months old, a committee of experienced operative who have been in the Maasai Market business +10 years, who have also suffered the mayhem that brokers bring to the business. I have been to the market on two weekends and their was no undue pressure to make purchases. The maasai markets in kenya are full of brokers who make it impossible to shop in peace.....but i recently went to the maasai market in galleria mall ....and i have to say that i was realy suprised to find out that there are NO brokers....it was a wonderfull shopping experience. Its true the market is wonderful, but i agree there is a problem of the sales/brokers who intrude the people buying, something i have observed is language barrier especially for the Maasai women sometimes visitors would like to buy from them but the language becomes a problem and immediately the buyer is whisked a way by the people who understand English. Glad to have got good people in here. I would like to thank those who replied and sent me private messages with the art of their hands. So far, I have not see something true African like the one I see displayed on the Market. Though I got the sandles, the belts, kiondos, and keychains plus bead work. It's true that masai markert is a place must visit in kenya. the Massai Market is really great but the customer service is overdone in away that customers themselves are not comfortable. Its also the price these people put when they see someone white. The market is supposed to be the best for everyone not reise the Price for the tourist then lower the price for the citizens. Do we have aregulated Government Price in this market or they just come up with the Price when they see you. Even as a Kenyan (married to a Caucasian), ITA about the pushy sale speople at Masai Market. The non Kenyan cannot look at anything in peace. You will also pay dearly for anything you buy. In most cases more than double the price a local will pay. Anyone who befriends you at the market is just there to exploit you so he also gets a cut of the money:)) He is not there to help lower the price for you, he is there to make sure you pay a high price so he gets a share from the Seller. Any price you are told is most probably 10 times higher than it´s worth:)) So you have to negotiate with them. And even then, you will still pay a high price. But if you are okay with that, then it´s all good. I went to the masai market today as a visiting canadian. The art at this market is truely wonderful. From the moment I stepped into the market I was bombarded with people grabbing and pulling me to see all of their merchandise. After about 5 minutes I wanted to get out of there. I really wanted to buy a lot of things but I found it so difficult to look when being bombarded with salesman who would not take no for an answer. I ended up not buying anything which was really disappointing. I am in nairobi for a month and hope to go again next weekend to purchase something but am a little apprehensive about the whole experience. Am very proud to see the effort and hand work done by kenyans to show the world our art. These are people who are trying to make their life better and errandicate povery in our kenya. They market their product at massai market, which is the only way they know. There are other ways to sell the kanyan art if only the goverment is willing to so. Why is there such a well aganished process of marketing kenyan flowers to the world market and not art? Thanks ARTISTS for your good job and we hope one day kenya will be a nation where commom man will have a stand. GOD BLESS KENYA!!! Kenya is the place to be....no doubt....it is a beautiful country full of resources, friendly people and smiling faces despite the adversities of life!! I am Kenyan, I live in kenya and Kenya is blessed!! Navid, thanks for you pic. The Maasai Market is a wonderful place. There's so much beautifull stuff for sale that it was hard for me to pick anything. And great to see people from so many countries visiting Kenya and using this website. This site is receives visitors from over 120 countries in the world! We truely live in cosmopolitan times.